Infidelity has different faces…and different signs and patterns. Yes, infidelity is complex. You probably know that or perhaps feel the overwhelm and confusion. Most I work with find tremendous relief, a sense of control, confidence and power once they pinpoint the situational signs of infidelity. Understanding IS the beginning of healing. Yes, there are general signs of infidelity that indicate that your husband or wife may be cheating. After you finish reading this page you will find a link for those general signs of infidelity. But, to accelerate breaking free you need to dig into and nail down the signs and patterns of infidelity. 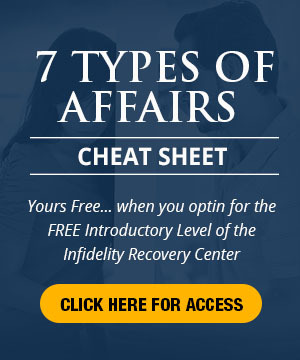 Did you know there are 7 different kinds of affairs? Well, there may be more, but after a couple decades of clinical work and research, I’ve identified 7. And, if you look carefully, you will find that each form of infidelity carries different signs and markers. 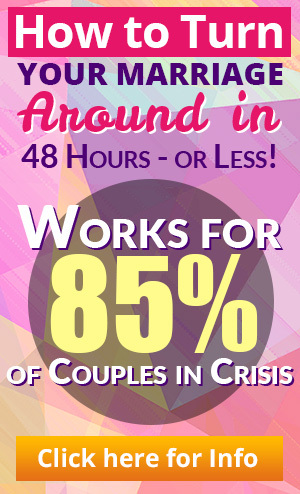 Know those specific signs of infidelity and you can save yourself much grief. 1. Expect that your spouse will have a very powerful attachment to the other person. The other person will consistently be on her mind. Your spouse will shift energy away from you, the children, the household and her career to her affair relationship. She will be focused, but not on you. Your spouse will attempt to push you away by avoiding you, ignoring you, closing off communication or walking away. 2. The affair will most likely be a long-term affair. It will be very difficult for your spouse to walk away from the other person. He may try on a number of occasions but will continue to gravitate back to the other person. He will hold on tenaciously. This is probably the first or only affair for your spouse. Your spouse is not interested in playing or fooling around but powerfully attaching to the other person. The other person is the savior! 3. Don’t believe that the affair was planned before hand because of a bad marriage. These affairs usually just happen. They usually happen with someone in close proximity: co-worker, neighbor, friend (frequently of friends with whom you socialize), etc. The other person is usually the aggressor, your spouse lacking the confidence to seek out the affair. The rationale that it happened because of a lousy marriage comes after the affair is in bloom. 4. The more you try to persuade, convince or pursue, the more strongly he will attach to the other person. He will perceive your efforts as weakness and will want to attach more intently to the other person whom he (at perhaps an unconscious level) deems to be the powerful and loving answer-to-all. 5. Efforts to use moral or religious arguments to call a halt to the affair will be strongly resisted. Your spouse is not guided by rightness or wrongness. These standards have not been internalized and do not carry much weight, especially when it comes to the important chunks of her life. The actions and thoughts of your spouse primarily originate from her need to attach to another person. Any behavior or concept that serves the purpose of maintaining the attachment will be valued. Others are discarded. 6. Expect you will spend a significant amount of time and emotional energy in the next 2 to 4 years (especially if there are children) attempting to resolve the relationship. By resolve, I mean, coming to a point where each of you are fairly free of the emotional entanglement that holds you together and generates the pain and fear. It will be important for you to resolve the relationship whether you continue to be married or separate and divorce. Does this fit your situation? Do you see the importance of understanding in-depth the signs of infidelity. Once you do, you will have many more options available that will help you break free.